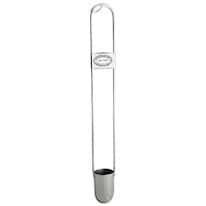 Viscosity cups measure viscosity by using gravity. A precise amount of liquid flows through an orifice located at the bottom, which is measured over time to calculate a viscosity value. Viscosity cups are an economical choice and produce very reliable results. They require tight sample temperature tolerances and user accuracy. We offer three types of viscosity cups appropriate for many applications. Zahn style viscosity cups are ideal for use in shops, factories, and labs. Ford Dip cups are good for testing a variety of thin coating materials as well as feature an easy to use handle for in the field testing. Ford viscosity cups are user-friendly and are calibrated to NIST-traceable oils. Browse our selection of viscosity cups and find the one that fits your needs.